A small residence, on the eastern bank of Lake Como. This holiday home is made up of 5 new holiday apartments, furnished in a pleasant fashion. Views from the residence are spectacular as it dominates the lake below. Large shared grounds surround the residence, made up of terraces planted with olive groves and chestnut trees. You are in Verginate: a village that dates back to 1800. Its age-old charm is left intact and each old stone has its own story to tell, just like the old and new stones used to entirely renovate the rural property. The lake side views afforded from here are unbeatable. 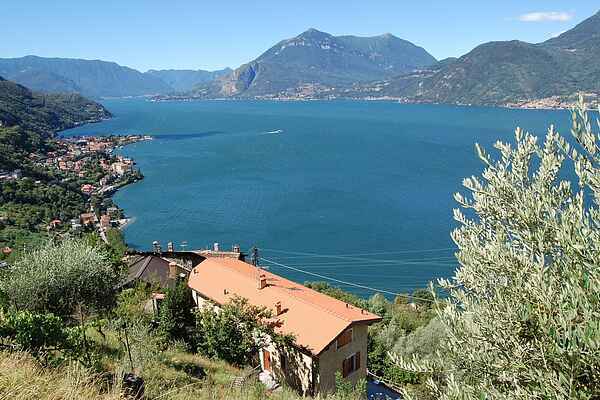 They stretch as far as Menaggio, Dervio and the Bellagio peninsula. Perfect for a relaxing holiday, breathing in pure air. Guests will bask in peace and quiet with a historical context, where it is possible to enjoy the sunshine, the greenery and the views or wander lanes leading through woodland and other small villages. The owner can provide information on possible excursions, (also with guides), the local mountain bike trails and visits to nearby museums. N.B: the final section of the access road is a rising mountain path with hairpin bends. Very cumbersome vehicles such as SUVs and trailers are not advisable. The owner will wait for you at the meeting point to show you into the residence.